Aristide Faccioli was an Italian engineer. In the late 1800s, he became fascinated with aviation and worked to unravel the mysteries of powered flight. With little progress in aviation, Aristide had turned to automobile development by 1898. He worked for Ceirano GB & C and designed Italy’s first automobile, the Welleyes. Ceirano GB & C did not have the finances to produce the automobile, so a new company was established for automobile production. This company was called Fabbrica Italiana Automobili Torino or FIAT, and it bought the rights, plans, and patents for the Welleyes. The Welleyes became FIAT’s first production automobile, the 3 ½ CV. 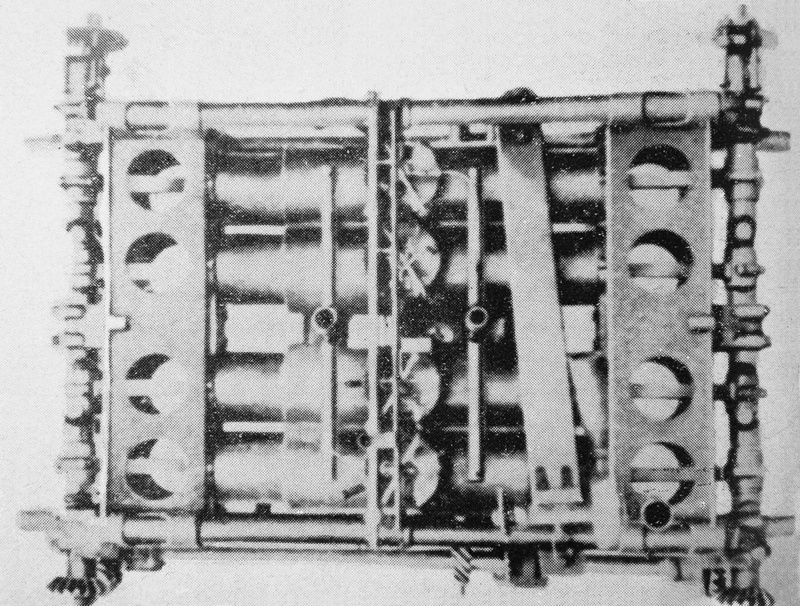 The SPA-Faccioli N.1 engine with its four cylinders, each housing two opposed pistons. At the rear of the engine (bottom of image) is the cross shaft linking the two crankshafts. Note the gear on the cross shaft that drove the camshaft. Aristide became FIAT’s first technical director, but he left in 1901 to start his own automobile company. In 1905, Aristide moved from automobile production to engine design. However, Aristide’s focus returned to aviation once he learned of the successful flights of the Wright Brothers and other early pioneers. In 1907, Aristide shut down his companies and worked on aircraft and aircraft engine designs. In 1908, Aristide visited a close friend, Matteo Ceirano, seeking financial support. Matteo was one of Ceirano GB & C’s founders and was a co-founder of SPA (Società Ligure Piemontese Automobili). Matteo and SPA backed Aristide and encouraged him to continue his aeronautical work. Aristide’s first engine was the SPA-Faccioli N.1. The N.1 was a water-cooled, horizontal, opposed-piston engine. Each side of the engine had a crankshaft that drove pistons in the engine’s four, individual cylinders. Attached to each crankshaft was a propeller. The crankshafts and their propellers turned in opposite directions (counter-rotating). When viewed from the rear of the engine, the right propeller turned clockwise, and the left propeller turned counterclockwise. The two-blade, wooden propellers were phased so that when one was horizontal the other was vertical. The dual, counter-rotating propeller design was an effort to eliminate engine vibrations and cancel out propeller torque. This rear view of the SPA-Faccioli N.2 illustrates that the engine was much more refined than the N.1. Note the magneto driven above the cross shaft and the gear train driven below. The two crankshafts were synchronized by a bevel-gear cross shaft that ran along the rear of the engine. Geared to the cross shaft was a camshaft that ran under the engine. The camshaft actuated the intake and exhaust valves that were located in the middle of each cylinder. As the two pistons in each cylinder came together, the air/fuel mixture was compressed. Once the mixture was ignited by the spark plug in the middle of the cylinder, the expanding gases pushed the pistons back, operating like any other four-stroke engine. The N.1 had a 4.41 in (112 mm) bore and a 5.91 in (150 mm) stroke. The two pistons per cylinder effectively gave the N.1 an 11.81 in (300 mm) stroke. The engine displaced 721 cu in (11.82 L) and produced 80 hp (60 kW) at 1,200 rpm. The N.1 weighed 529 lb (240 kg). The N.1 engine was installed in the Faccioli N.1 aircraft, which was a triplane pusher design. Flown by Mario Faccioli, Aristide’s son, the engine, aircraft, and pilot all made their first flight on 13 January 1909. The aircraft quickly got away from Mario, and the subsequent crash injured Mario and destroyed the aircraft. Although brief, the flight marked the first time an Italian-designed and built aircraft was flown with an Italian-designed and built engine. With all parties undeterred, the N.1 engine was installed in the Faccioli N.2 aircraft (a biplane pusher with a front-mounted elevator) and flown by Mario in June 1909. After a few flights, Mario and the N.2 aircraft were involved in an accident that again injured Mario and destroyed the aircraft. 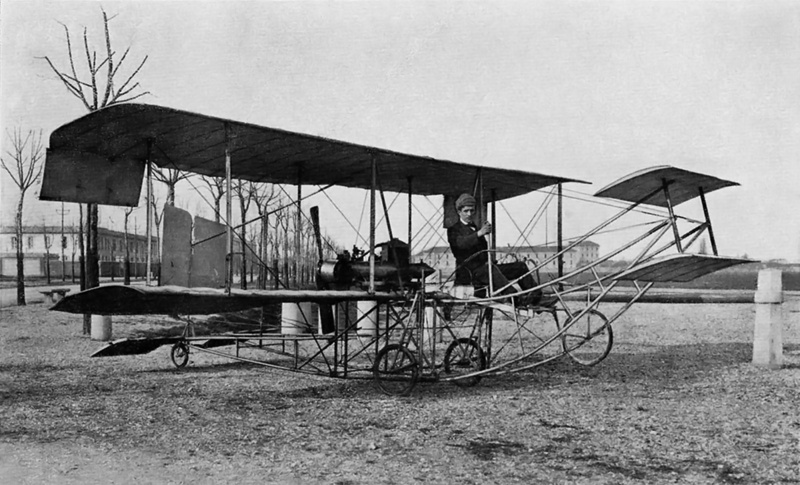 Mario Faccioli sits on the Faccioli N.3 aircraft in 1910. 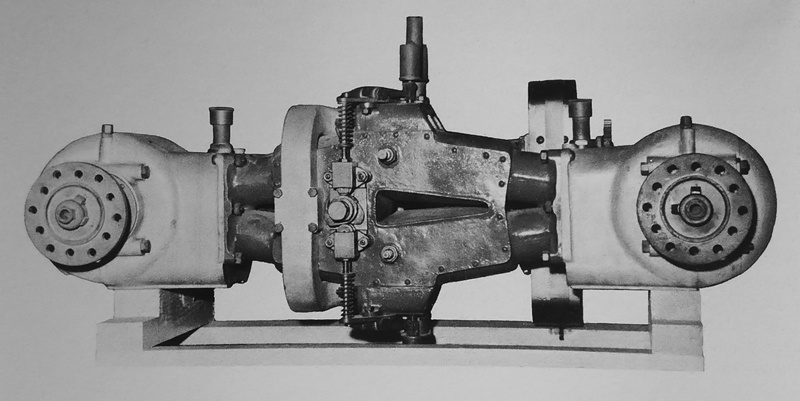 Note the covers over the N.2 engine’s cross shaft bevel gears. Since the propellers rotated in opposite directions, when one was vertical, the other was horizontal. After these setbacks, Aristide designed a new engine, the SPA-Faccioli N.2. 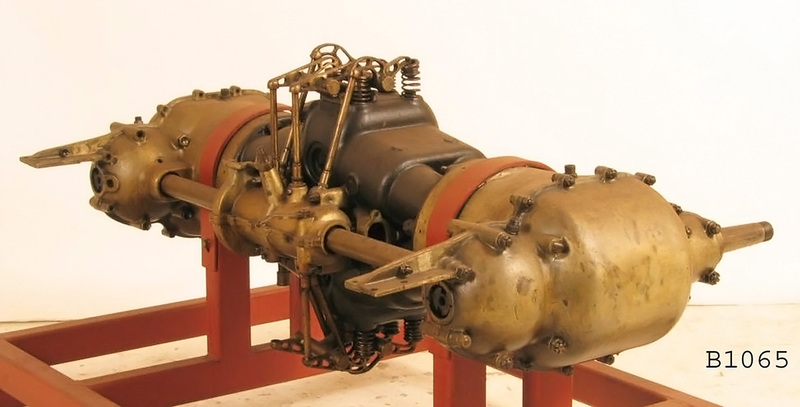 The N.2 had many features in common with the N.1: water-cooling, opposed-pistons, dual crankshafts, a bevel-gear cross shaft, and counter-rotating propellers. However, the N.2 was a single cylinder engine. The engine’s magneto was driven from the cross shaft. The N.2’s intake was positioned on the bottom side of the engine, and exhaust was expelled from the top side. The N.2 had a 3.94 in (100 mm) bore and a 5.12 in (130 mm) stroke—a 10.24 in (260 mm) equivalent for the two pistons per cylinder. The engine displaced 249 cu in (4.08 L) and produced 20 hp (15 kW) at 1,200 rpm and 25 hp (19 kW) at 1,500 rpm. The N.2 weighed 106 lb (48 kg). The N.2 engine was installed in the Faccioli N.3 aircraft. With a very similar layout to the N.2 aircraft, the N.3 pusher biplane was smaller and did not have the front-mounted elevator. Mario was again the test pilot, and he first flew the aircraft on 12 February 1910. Many flights were made throughout February and March. On 26 March 1910, one propeller came off the engine and damaged the aircraft while it was in flight. Mario was injured in the subsequent crash, and the N.3 aircraft was damaged. Aircraft and pilot flew again in the summer, but Aristide was already working on a new aircraft design. The N.2 engine was installed in the Faccioli N.4 aircraft, a further refinement of the Faccioli line. The aircraft was first flown by Mario in July 1910. On 15 October 1910, Mario used the N.4 aircraft to get his Italian pilot’s license (No. 21). This was the first time an Italian-designed and built aircraft was used to obtain a pilot’s license. For his next aircraft, the Faccioli N.5, Aristide needed more power. The new SPA-Faccioli N.3 engine was built upon knowledge gained from the previous engines. Again, the engine was water-cooled with opposed-pistons and had dual crankshafts (synched by a bevel-gear cross shaft) that drove counter-rotating propellers. However, the cylinder arrangement of the N.3 was unique. In essence, the N.3 was made up of two V-4 engines mounted horizontally and attached together via their combustion chambers. The cylinders of the complete engine formed a diamond shape, with the cylinders angled at 20 degrees relative to the crankshaft. This gave the cylinders a 160 degree bend at their middle. Technically, the pistons no longer shared a common cylinder, but the cylinders did still share a combustion chamber. Some sources define the N.3 as a four-cylinder opposed-piston engine, and other sources define it as an eight-cylinder engine in which opposed pairs of cylinders shared a common combustion chamber. The N.3 engine’s intake manifold can be seen on the left side of the image; the exhaust ports are also visible to the right of the valves. Note the camshaft extending through the engine, and the pushrods that actuated the valves. The front side of the engine still has its two spark plugs. Two magnetos were driven from the cross shaft at the rear of the N.3 engine. The magnetos fired one spark plug per cylinder pair. The spark plugs were positioned either on the front of the engine or on the back, depending on the cylinder. The cross shaft also drove a short camshaft that extended through the diamond between the cylinders. Via pushrods and rocker arms, the camshaft actuated the one intake and one exhaust valve for each cylinder pair. An intake manifold mounted to the front of the engine brought air and fuel into the right side of the engine, and the exhaust was expelled from the left side of the engine. The N.3 had a 2.95 in (75 mm) bore and a 5.91 in (150 mm) stroke. The engine displaced 324 cu in (5.30 L) and produced 40 hp (30 kW) at 1,200 rpm and 50 hp (37 kW) at 1,600 rpm. The N.3 weighed 198 lb (90 kg). The N.3 engine was finished in early 1911, but the Faccioli N.5 aircraft was not. The N.3 engine was installed in the N.4 aircraft, and Mario continued his role as chief pilot. The N.3-powered N.4 aircraft was entered in various competitions during the Settimana Aerea Torinese (Turinese Air Week) held in June 1911. On 25 June 1911, the last day of the competition, a mechanical failure on the aircraft caused Mario and the N.4 to crash. As with previous crashes, Mario was injured, and the aircraft was destroyed. The Faccioli N.4 aircraft was originally powered by the SPA-Faccioli N.2 engine. In 1911, the eight-cylinder SPA-Faccioli N.3 engine was installed. This image was taken in June 1911, with the N.3 engine installed and Mario in the aircraft. It is not clear if the Faccioli N.5 aircraft was ever completed. Aristide’s involvement in aviation seemed to wane after the crash of the N.4 aircraft. In fact, the last SPA-Faccioli engine may have been a development of the N.3 undertaken exclusively by SPA without much involvement from Faccioli. Built in late 1911 or early 1912, the SPA-Faccioli N.4 engine was an enlarged and refined N.3. With the N.4, eight cylinders were again positioned in a diamond configuration, angled at 20 degrees at the crankshafts and 160 degrees at the combustion chambers. Each opposed cylinder pair shared a common combustion chamber. Each cylinder pair now had two spark plugs, and they were fired by two magnetos, one driven directly from the rear of each crankshaft. The cross shaft synchronizing the crankshafts also served as the camshaft. At the rear of the engine, the cross shaft drove pushrods that acted on rocker arms mounted to the top and bottom of the engine. The rocker arms actuated the one intake and one exhaust valve per cylinder pair, positioned at the center of the cylinders. The intake manifold was positioned behind the engine, to the left of center. The manifold fed the air/fuel mixture to a passageway in the cylinder casting that ran on the left side of the valves. The exhaust was expelled to the right of the valves. The N.4 engine had a 3.74 in (95 mm) bore and a 5.91 (150 mm) stroke. The engine displaced 519 cu in (8.51 L) and produced 80 hp (60 kW) at 1,200 rpm and 90 hp (67 kW) at 1,600 rpm. The N.4 was 54 in (1.38 m) wide, 32 in (.82 m) long, 22 in (.57 m) tall, and weighed 441 lb (200 kg). No information has been found to indicate that the engine was installed in any aircraft. After surviving so many close calls, Mario Faccioli was sadly killed in a plane crash in March 1915. The type of aircraft involved in the crash is not known. Aristide Faccioli never achieved the success he strived for and never recovered from his son’s death. He took his own life on 28 January 1920. SPA-Faccioli N.3 and N.4 engines are preserved and on display in the Museo Storico dell’Aeronautica Militare in Vigna di Valle, Italy. An N.4 engine is displayed in the Museum of Applied Arts & Sciences, Museums Discovery Centre in Castle Hill, Australia. 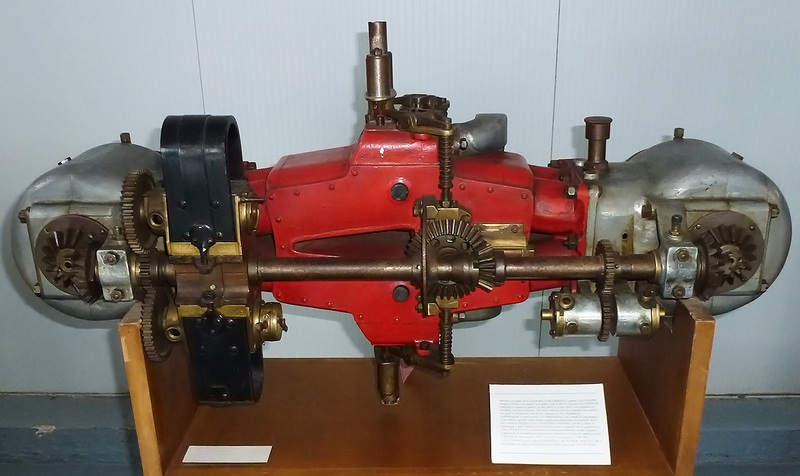 The museum lists the engine as a “300 hp, model 2-A,” undoubtedly confusing the eight-cylinder SPA-Faccioli engine with a SPA Type 2-A straight-eight engine. Also, the N.4 is positioned upside-down in its display stand. This entry was posted in Aircraft Engines, Through World War I on 5 July 2017 by William Pearce.